Sure, your suite at the Deerfield Red Roof may be slick by Western Mass. standards, but some master hotel rooms around the world are so over-the-top that even seasoned jet-setters will drop a jaw upon checking in, and checking out for that matter -- you know, since they're getting a $100,000 dollar bill and all. 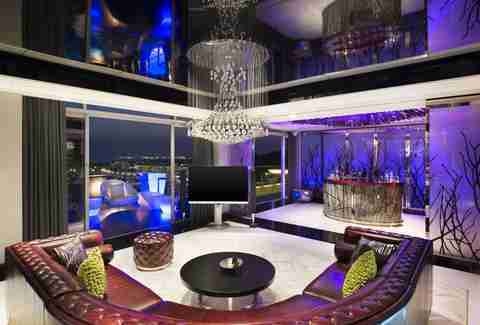 To give you a glimpse into the world of the one percent, we rounded up 10 of the craziest, most tricked-out hotel suites on the planet. Acrophobics, beware! One of the tallest hotels in the world, Ritz-Carlton Hong Kong's two-bedroom suite is the hotel’s highest room and floats above the clouds on the 117th floor. Spanning 4,460sqft, the room's view of Victoria Harbour is breathtaking, and the en-suite marble bathroom rocks a separate rain shower, whirlpool, and dry sauna. With a name that tells you exactly what you're in for, the Extreme Wow Suite at W Singapore has all the makings of an ultimate party pad -- as in a fully stocked bar, DJ booth with turn tables, stainless steel Jacuzzi tub, drop-down TV, and outdoor stone terrace with views of the South China Sea. Did we mention the private plunge pool that has likely once been filled with Veuve Clicquot? Boasting floor-to-ceiling windows through which to gaze whilst patting yourself on the back for succeeding in life, the Royal Etihad Suite at Jumeirah at Etihad Towers in Abu Dhabi is a four-bed/six-bath, two-dining room, 60th floor (as in, all of it) paradise complete with a butler, limo service, and insane views of the Arabian Gulf. The super-glam presidential suite at Hotel Bel Air is actually a "compound" that's completely removed from the rest of the property's celebrity and royal guests. French doors open up to a pool and private Spanish courtyard complete with a fireplace, Jacuzzi, and plenty of California sunshine. 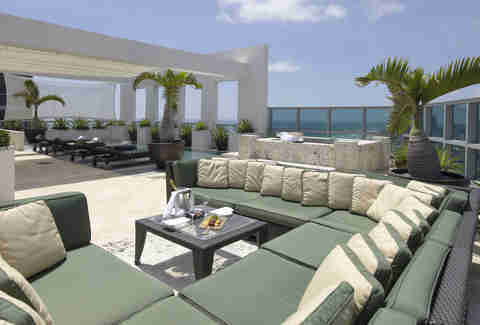 No other hotel in Miami offers a 10,000sqft suite that takes up an entire floor of the building. This four-bedroom/four-bath penthouse boasts killer South Beach views, two Jacuzzi tubs, and a Steinway piano that's gotten play from both Madonna and Simon Cowell. The biggest perk has to be the private rooftop pool, though -- the key to which only suite guests hold. 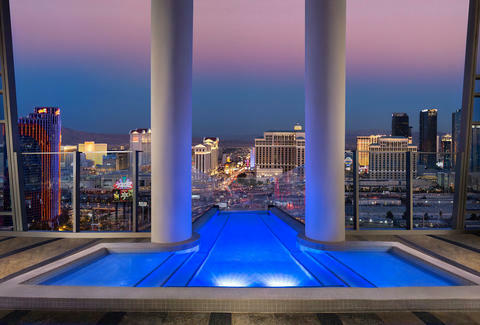 Formerly known as the Hugh Hefner Suite, the Two Story Sky Villa at Palms Casino Resort may be off the Strip, but it's worth the schlep. The four-bedroom, 3.5-bath "villa" comes with all the amenities a $35,000/night accommodation should have, including a 12-person Jacuzzi pool overlooking the city, an en-suite glass elevator, double-height parlor space, private terraces, a fitness room with dry sauna, and, of course, a 360-degree rotating bed. Oh, behave! 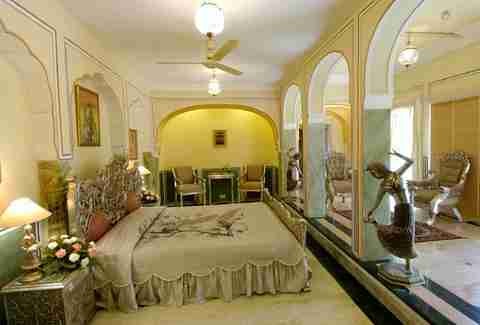 Perhaps the most extravagant and mindbogglingly opulent suite in the world, the Presidential at Raj Palace Jaipur is a four-level, 16,000sqft crash-pad tricked out with hand-carved archways, gold-leaf walls, and marble floors. 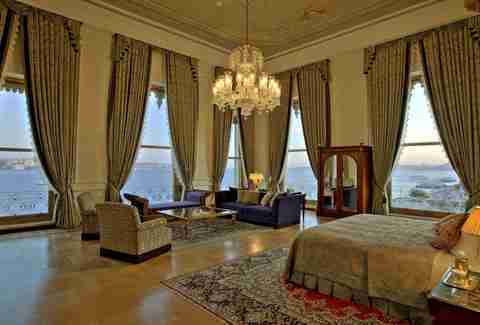 It's also packed with priceless antiques, gold/silver furniture, and a private pool/Jacuzzi/bar. Did we mention the private museum? Yeah, it has one of those as well. This 16th-century building was rebuilt in marble for the sultan in 1857, and the 4,950sqft corner suite (one of the largest in the country) is decked out in period furniture and centuries-old art. There's a stand-alone infinity bathtub, and a private butler to draw said bath for you. 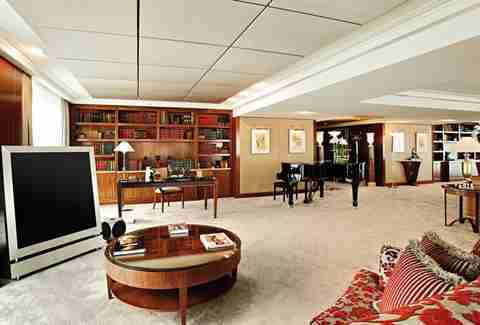 One of the most expensive suites in the world is also one of the most elaborately designed -- think walls inlaid with thousands of pieces of mother of pearl and calfskin leather, diamond skylights, and cathedral ceilings. 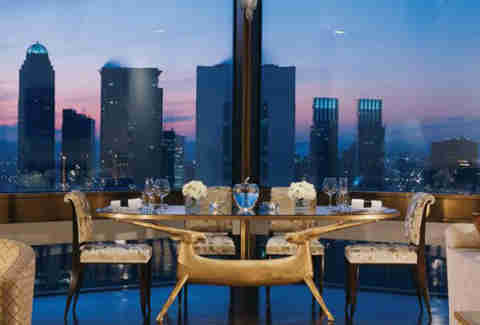 The nine-room suite comes equipped with a private elevator and massive outdoor terrace that provides guests with a 360-degree view of Manhattan. Also, you get a 24/7 butler and a chauffeured Rolls Royce. Assuming you’re headed to Switzerland to personally access your bank account, be one of the select few who've overnighted in this 12-room, 18,000sqft chamber fully equipped with bulletproof doors/windows and a private elevator, not to mention fitness center, billiard room, and helipad. Oh yeah, you also get a front-and-center view of Lake Geneva and Mont Blanc.